Mission is a city in Hidalgo County, Texas, United States. The population was 77,058 at the 2010 census and an estimated 83,563 in 2016. Mission is part of the McAllen–Edinburg–Mission and Reynosa–McAllen metropolitan areas. ✪ A Visit to the Mega WinterTexan Fiesta in Mission,Texas. A WinterTexan Must! Mission is in southern Hidalgo County at 26°12′41″N 98°19′17″W﻿ / ﻿26.21139°N 98.32139°W﻿ / 26.21139; -98.32139 (26.211402, -98.321277). 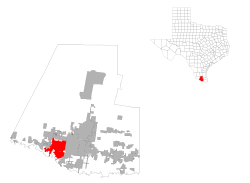 It is bordered to the east by McAllen, the largest city in the county, to the north by Palmhurst, to the west by Palmview, and to the south by the Mexico–United States border along the Rio Grande. The Interstate 2/U.S. Route 83 freeway passes through Mission, south of the center of town. The highway leads east 5 miles (8 km) to downtown McAllen and 41 miles (66 km) to Harlingen. Interstate 2 ends 7 miles (11 km) west of Mission; US 83 leads west 34 miles (55 km) to Rio Grande City. According to the United States Census Bureau, Mission has a total area of 34.1 square miles (88.2 km2), of which 34.0 square miles (88.0 km2) are land and 0.1 square miles (0.2 km2), or 0.20%, are water. As of the census of 2000, there were 45,408 people, 13,766 households, and 11,384 families residing in the city. The population density was 1,881.9 people per square mile (726.6/km²). There were 17,723 housing units at an average density of 734.5 per square mile (283.6/km²). The racial makeup of the city was 77.63% White, 0.37% African American, 0.38% Native American, 1.63% Asian, 0.01% Pacific Islander, 18.64% from other races, and 2.34% from two or more races. Hispanic or Latino of any race were 81.03% of the population. There were 13,766 households out of which 43.4% had children under the age of 18 living with them, 64.8% were married couples living together, 14.5% had a female householder with no husband present, and 17.3% were non-families. 15.3% of all households were made up of individuals and 9.1% had someone living alone who was 65 years of age or older. The average household size was 3.29 and the average family size was 3.68. The median income for a household in the city was $30,647, and the median income for a family was $33,465. Males had a median income of $25,710 versus $20,718 for females. The per capita income for the city was $12,796. About 22.6% of families and 26.8% of the population were below the poverty line, including 37.4% of those under age 18 and 15.6% of those age 65 or over. The United States Postal Service operates in the city of Mission. Local zip codes include 78571, 78572, 78573, and 78574. Moore Air Force Base (deactivated) is located 15 miles (24 km) north of the city. It is the location of the First Lift Station of the Mission Canal Company that once irrigated 15,000 acres (61 km2) of farmland in the Rio Grande Valley. Jamaar Taylor, attended Mission High School and played football, later being drafted by the New York Giants. After his retirement he helped coach at Mission Veterans Memorial High School for a brief period. Most of Mission is a part of the Mission Consolidated Independent School District. Other portions extend into the La Joya Independent School District and the Sharyland Independent School District. Mission CISD operates Mission High School and Veterans Memorial High School. Sharyland ISD Mission is divided between Sharyland High School and Sharyland Pioneer High School. LJISD Mission is zoned to Palmview High School. In addition, South Texas Independent School District operates magnet schools that serve the community. Mission is also the site of San Juan Diego Academy, a Catholic high school operated by the Roman Catholic Diocese of Brownsville. ^ "History of Mission". City of Mission. ^ a b "Geographic Identifiers: 2010 Census Summary File 1 (G001): Mission city, Texas". American Factfinder. U.S. Census Bureau. Retrieved February 16, 2018. ^ Bureau, U.S. Census. "American FactFinder - Community Facts". factfinder.census.gov. Retrieved 18 March 2018. ^ "Post Office Location - MISSION Archived 2010-05-16 at the Wayback Machine." United States Postal Service. Retrieved on May 9, 2010. ^ Hennessy-Fiske, Molly (February 8, 2019). "A border fence could seal off this tiny Texas chapel, but its worshipers aren't giving up". Los Angeles Times. Retrieved 16 February 2019. ^ "Home of the Grapefruit (Mission slogan)". ^ "Aldine thrashes mission 54-21 despite Detmer's 364 yards". Austin American Statesman. ProQuest. 9 December 1990. Retrieved 26 January 2017. ^ "SCHOOL DISTRICT REFERENCE MAP (2010 CENSUS): Hidalgo County, TX." U.S. Census Bureau. Retrieved on August 2, 2018. ^ "Mission CISD School Zones." Mission Consolidated Independent School District. Retrieved on August 2, 2018. See HTML version. Junior high boundaries are determined by the elementary school zoning, with some optional exceptions, while high school boundaries are described by text. ^ Attendance boundary map. Sharyland Independent School District. Retrieved on August 2, 2018. 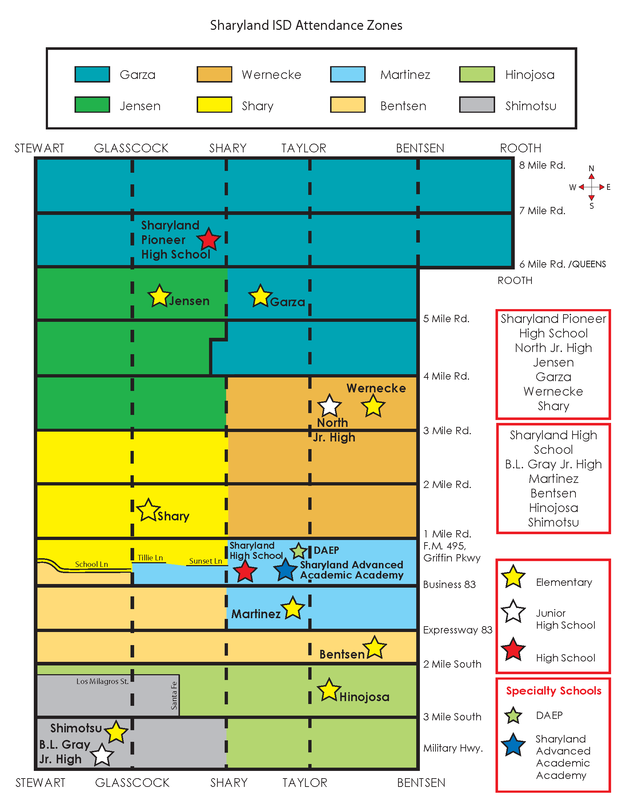 See also simplified map which also has a chart stating which elementary schools feed into which secondary schools. ^ "High School Zones 2017-2018." La Joya Independent School District. Retrieved on September 16, 2018. ^ "Welcome to the Speer Memorial Library." City of Mission. Retrieved on May 9, 2010. ^ a b "About the Library." Speer Memorial Library. Retrieved on May 9, 2010. ^ "As part of Mission's Cinco De Mayo celebrations, the City of Mission held a special event signing with its newest Sister City of General Terán, Nuevo León, Mexico. - City of Mission". missiontexas.us. Retrieved 18 March 2018. Wikimedia Commons has media related to Mission, Texas.